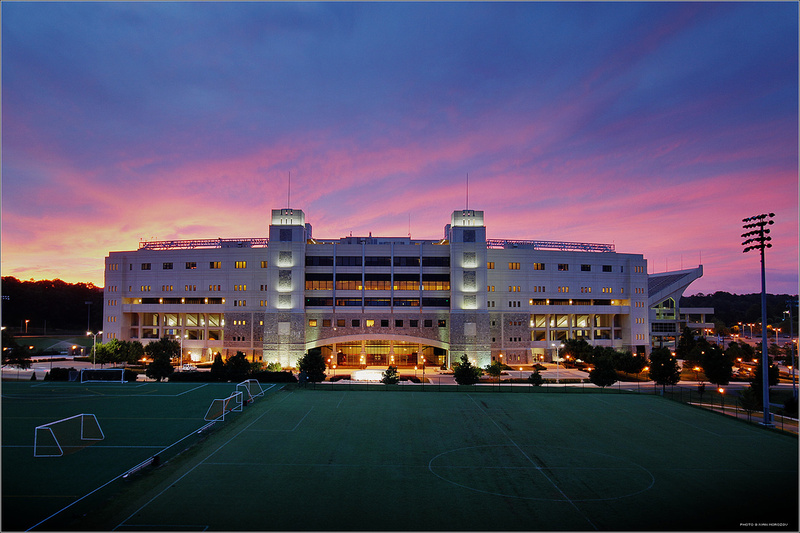 The eight iconic pylons, overlooking the massive drill field in the center of Virginia Tech’s campus, are one of the most memorable and widely photographed landmarks on campus. Each pylon stands for a different value considered important by the university. Torgerson Bridge, arching over the main entrance to campus, is another widely visited attraction at VT for visitors and students alike. The inside of the Torgerson Bridge is beautifully designed and makes for a very popular study spot (see below). Virginia Tech boasts one of the strongest fan bases for college football in the country. Game day in Blacksburg hosts thousands of massive tailgates as 66,000 people prepare to cheer the Hokies on. VT, with one of the top three dining plans in the country, makes for a great collegiate experience or weekend visit. Seen above, the $35 million dining hall, Turner Place, has everything from bagels to gelato to hibachi. Come sundown in Blacksburg, whether you're looking for a bite to eat or heading towards the bars, Main Street is the best place to be. Top of the stairs, TOTS, is Blacksburg’s most popular bar. TOTS legendary drink, the rail, is widely known as the strongest drink in Blacksburg. Do not go to TOTS without trying a rail. After a late night downtown, there is only one place to eat. Benny Marzano’s. Benny’s offers enormous slices of pizza that are well over a foot long. The historic Woodburn Hall is located at the heart of WVU’s downtown campus and is West Virginia’s most iconic building boasting some of the oldest and boldest architecture around. 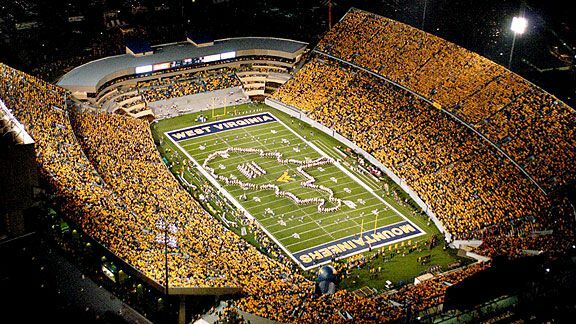 The home of the Mountaineers, Milan Puskar Stadium, has a capacity of over 60,000 and is the place to be on game day! The Personal Rapid Transit system (PRT) is a major form of transportation throughout WVU’s massive campus with four locations, Beechurst (downtown campus), Walnut (downtown), Engineering (Evansdale Campus), and the Medical campus. *Note it is not the most reliable form of transportation, as many students will tell you. West Virginia’s Mountain Lair is located on the downtown campus and is the center for student gathering. Inside, the mountain lair has plenty of food options including, Chick fil A, Sbarro, Burger King, and Quiznos. Also included, a full size movie theater, bowling ally, and pool tables. WVU’s Evansdale campus is home to the Creative Arts Center, Engineering, Agricultural Sciences, Student Housing and Rec. Center just to name a few. The WVU Rec. Center is located on the Evansdale campus and would blow any planet fitness out of the water. Included in this massive $34 million building is, a full size pool and hot tub, rock climbing wall, two large lifting/fitness areas, an indoor track, volley ball, basketball, and badminton courts, as well as glass squash and racquet ball courts. WVU leaves you with no excuse for missing the gym. As far as the bar scene goes, High St. is the place to be. Morgantown offers both 21 and 18 and over bar/clubs ranging in themes to capture every crowd. 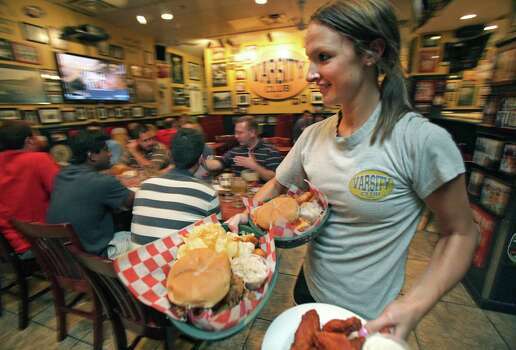 For an epic meal, Morgantown has plenty to offer. From a classy dine in meal with the family, to your drunken pit stops, Morgantown has it all. Here at Queue U we like our drinks cold. Help us to #bringthecoolerback by sending us the best cooler pics you can find to management@queueu.com. The best coolers will be featured on our weekly #bringthecoolerback post. Add vodka and peach schnapps to a highball glass over ice. Fill with equal measures of cranberry juice and orange juice, and stir. For garnish add an orange wheel and a cherry. Combine ingredients in microwave safe bowl.